Please complete the form below and your enquiry will be sent directly to Pearly Beach Conservancy via email. Your enquiry has been sent to Pearly Beach Conservancy. The Pearly Beach Conservation Society was established in December 1991 and during December 2007, the name changed to Pearly Beach Conservancy and is as such registered at CapeNature. The aims of the Conservancy are to promote the conservation, protection and restoration of all natural systems and resources of the Pearly Beach area with particular attention to indigenous plant and animal life. The rapid development of the area places a huge burden on the remaining fynbos veld and fauna and therefore the Conservancy plays an active role in promoting the importance of eco sensitive planning and development, the establishing of water sensitive indigenous gardens, the conservation of the green belt of natural fynbos veld and the eradication of alien species, eg. Rooikrans, Port Jackson and Manatokka. ANNUAL MEMBERSHIP FEES of the Conservancy are R30 for adults or R50 per family. The Conservancy believes that membership is a must for anybody that has an interest in the conservation of our unique area. All property owners in Pearly Beach, as well as visitors to our area, are drawn together by a common passion to conserve the natural splendour of Pearly Beach and its environment. We see Pearly Beach as a CONSERVATION COMMUNITY reinforced by a CONSERVANCY to which every property owner is invited to belong. Pearly Beach is a conservation community working together as a team to ensure that the unique character of Pearly Beach will be conserved for generations to come. We strive to be a caring community united by our passion to conserve the natural splendour, ecological processes and biodiversity of Pearly Beach, and keen to share our appreciation of the environment with others. 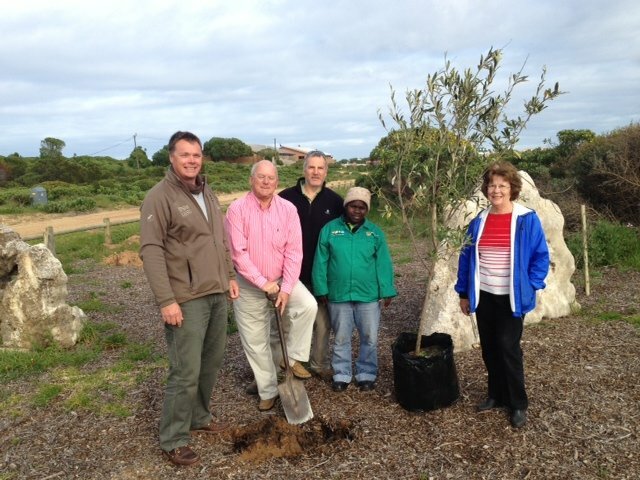 to co-operate with other groups within the greater Overberg area which have similar aims to those of this Conservancy. As a Conservation Community we have zero tolerance for poaching! If we suspect anyone of poaching, we take action! As a Conservation Community we support indigenous gardening with a minimum of fences and walls enabling wildlife to move freely. and they conserve precious water, as many fynbos plants are drought resistant. Exotics often consume 60% more water than fynbos! LAWNS: Lawns, kept to the minimum area needed to protect homes from fire, should be planted with drought-hardy, indigenous buffalo grass. Kikuyu is an invasive alien and should be eradicated where possible. our beaches, roads and paths are not despoiled. dogs and cats do not hunt or disturb our wild birds and other wildlife. If your cat is a hunter, put a bell on its collar and please keep it in at night. Although our Conservancy has an understanding for the guidelines of the Overstrand Municipality to ensure that all new developments must be provided with streetlights, we trust that you will support our request not to have the streetlights switched on at this stage, as well as that outside lights at houses not be left burning throughout the night, for the following reasons: disturbing the life cycles of small game and insects that feed at night, for example bats, duikers, porcupines, etc. ; light pollution; the observation of stars, as well as the lights of ships at sea, will be severely impeded; the natural unspoilt environment will be totally disturbed. Fynbos requires little water, however keen gardeners install rainwater collection tanks for their gardening needs, especially as water restrictions are often imposed in summer. Our commitment to the Vision means that we should all try to keep Pearly Beach pristine. We participate in beach clean-ups and on our walks we pull out seedlings of Rooikrans and other invasive plants, and pick up any litter we see. The Clean Marine project has been conceived locally and is aimed at developing sustainable mitigating measures to address the adverse effect that marine pollution has on marine life in general and birds in particular. Clean Marine is a pilot study developed in the Overberg and will hopefully later be implemented along the entire South African coastline. The main project partners are BirdLife South Africa, represented by BirdLife Overberg and BirdLife Walker Bay, CapeNature, Coastcare, Dyer Island Cruises and the Overstrand Municipality. A common passion to conserve the natural splendour of Pearly Beach and its environment is shared by all property owners in Pearly Beach, as well as visitors to our area. We regard Pearly Beach as a CONSERVATION village reinforced by a CONSERVANCY which every property owner is invited to join. HISTORY Due to a need between the landowners of the area to liaise with each other, the Pearly Beach Conservation Society /Pearly Beach Bewaringsvereniging was founded in December 1991. One of the objectives of the Society was the conservation of the biodiversity of Pearly Beach. After many discussions and eventually commitments by most of the landowners, as well as support from the Pearly Beach Ratepayers’ Association, a resolution was taken at the annual general meeting of the Pearly Beach Conservation Society held on 20 December 2006 to establish a Pearly Beach Conservancy. The management of the Pearly Beach Conservancy is currently done by the Management committee of the Pearly Beach Conservation Society called the Conservancy Management Committee (CMC). The committee is composed exactly as prescribed for the executive of the Conservancy. VISION of the Conservancy: Pearly Beach is a conservation community working together as a team to ensure that the unique character of Pearly Beach will be conserved for generations to come. VALUES of the Conservancy: We strive to be a caring community united by our passion to conserve the natural splendor, ecological processes and biodiversity of Pearly Beach, and keen to share our appreciation of the environment with others. co-operate with other groups within the greater Overstrand area which have similar aims to those of this Conservancy. As a Conservation Community we support indigenous gardening with a minimum of fences and walls enabling wildlife to move freely. WHY INDIGENOUS GARDENS? * They preserve the natural character that makes Pearly Beach so special; * they reduce the risk of introducing alien plant species into the Conservancy; * they help ensure that indigenous pollinators (ants, beetles, birds, butterflies, etc.) are not disturbed by the introduction of exotic pollens or foreign pollinator species; * indigenous vegetation provides a secure habitat and food supply for indigenous birds, mammals, reptiles and insects; * and they conserve precious water, as many Fynbos plants are drought resistant. Exotics often consume 60% more water than Fynbos! Lawns, kept to the minimum area needed to protect our homes from fire, should be planted with drought-hardy, indigenous buffalo grass. Kikuyu (Pennisetum clandestinum) is an invasive alien species, is not supported for planting and should be eradicated where possible. The Conservancy envisages surveying and monitoring the Conservancy in close collaboration with the local authority e.g. public open spaces, road reserves, beaches and inshore marine areas and classifying these areas according to their condition e.g. (iv) Damaged - >50% alien infested or out of control, including areas heavily influenced by human-induced threats. Devise specific strategies for each of the above habitats so that those in categories (i) - (ii) will be reserved in the category into which they are presently classified and those in (iii) and (iv) will be progressively restored to at least category (ii) (restorative and managed interference). We view road reserves as natural Fynbos corridors through the Conservancy that is important and these areas must not be allowed to degrade. Members of the community will be encouraged to "adopt-a-road" and to participate actively in the restoration/preservation of these assets. People will be encouraged to have their properties included in the surveys envisaged and to volunteer participation in programmes to maintain or upgrade the classification awarded to their properties. To encourage participation, the CMC will lobby the Municipality for progressive rates concessions for owners who achieve category (ii). 2.1 We as Conservancy will assist the local authority in the correct management of the natural resources of the area. For this purpose we will liaise via the ward committee or other effective mechanism. 2.2 Law enforcement As a Conservation Community we have zero tolerance for poaching and other transgressions affecting the environment adversely. If we suspect anyone transgressing, we take action! 2.3 We will co-operate with other groups within the greater Overstrand area which have similar aims to those of this Conservancy e.g. Rooiels Conservancy. 3.1 We will liaise with the municipality to source ways of funding the new herbarium. 3.2 We will seek sponsors to fund different projects. 3.3 The CMC will develop budgets according to the objectives of the management plan. 4.1 Subject to the approved budget, we will employ people from the Pearly Beach communities to help with the eradication of aliens and clean the environment. We will liaise with the Rate Payers Association to ensure compliance with the building guidelines. The prospective purchasers of properties within the Conservancy will be fully informed about the Conservancy, the classification of the properties for sale and the Management Plan. 5.2 We will closely monitor developments in ecologically sensitive areas within and in the immediate surrounds of Pearly Beach. 5.3 As Conservancy we will liaise with relevant landowners to ensure protection of open areas. Where appropriate, we will assist landowners in the process of rezoning of properties to conservation zone. Although our Conservancy has an understanding of the guidelines of the Overstrand Municipality to ensure that all new developments must be provided with streetlights, we trust that you will support our request not to have existing streetlights switched on at this stage, as well as that outside sights at houses not be left burning throughout the night. Furthermore, we will support a dark sky policy in future for the following reasons: * disturbing the life cycles of small game and insects that feed at night, for example bats, duikers, porcupines, etc. ; * light pollution; * the observation of stars, as well as the lights of ships at sea, will be severely impeded; * the natural unspoilt environment will be totally disturbed; * insects responsible for the pollination of Fynbos are distracted and cannot perform their function. We will support the Clean Marine project which is aimed at developing sustainable mitigating measures to address the adverse effect that marine pollution has on marine life in general and birds in particular. The main project partners are BirdLife South Africa, represented by BirdLife Overberg and BirdLife Walker Bay, CapeNature, Coastcare, Dyer Island Cruises and the Overstrand Municipality. The Plan proposes a concerted effort to eliminate all declared alien invader plants both from the village and from the surrounding landscape. We have an active hacking team of volunteers but the responsibility for clearing aliens rests with the property owners, whether private or the Overstrand Municipality. For large properties heavily infested with aliens, the Plan suggests cooperating with the Department of Agriculture to allow the owners to submit and work to a 3-year alien clearing plan rather than to be forced to clear everything in one go. Where existing individual alien trees can be shown to serve a vital shade or screening purpose, the Plan envisages granting temporary exemption from removal while suitable indigenous trees are growing up to take their place. Residents are encouraged to regard it as their duty to pull out seedlings of Rooikrans (Acacia cyclops) and other invasive plants on walks. We should strive to keep Pearly Beach pristine and participate in clean-ups and pick up any litter we see on our walks. We will promote purchasing practices that reduce or eliminate the generation of waste. We will promote the responsible use and disposal of hazardous substances and promote the recycling of materials via the ward committee. We will encourage the containment of waste food products to prevent this from attracting scavengers. We support and promote responsible recycling and will support any recycling programs of the Overstrand Municipality. We urge our members to recycle household waste and to install individual compost heaps. Pearly Beach is a dog-friendly village, but owners are asked to respect local by-laws by ensuring that: * dogs are on leashes and under control at all times; * our beaches, roads and paths are not despoiled. If droppings are made where people can walk, please bag and remove them; * barking does not disturb the neighbourhood; * dogs and cats do not hunt or disturb our wild birds and other wildlife. If your cat is a hunter, put a bell on its collar and please keep it in at night. Fynbos requires little water; however keen gardeners install rainwater collection tanks for their gardening needs, especially as water restrictions are often imposed in summer. Water conservation information will be provided to Conservancy members and be used for member education to encourage rainwater collection and the recycling and use of grey water and the adoption of responsible usage practices to limit or reduce total water consumption. The Conservancy will produce a newsletter and press releases to highlight the need to preserve and protect the natural assets. Two newsletters per annum and a press release once a month will be produced. We will develop a database of all inhabitants for easy communication preferably by email. Possible future studies in the conservancy include: * Locations of Red Data plant and animal species. * Management of endangered species habitats. * A social impact assessment. * A heritage resources inventory and impact assessment to include cultural, historical and archaeological sites. * An analysis of the recording of all plants being picked and submitted to CapeNature. The Conservancy relies upon volunteers for all roles, with the exception of the supervisor and workers appointed as labourers or security/monitoring personnel. Nevertheless, all roles will be specified. Pearly Beach is divided into four Conservancy wards for purposes of division of work, member representation and to ease communication between members and the Conservancy Management Committee (CMC). The wards are demarcated by Beach Road, Tower Road and Harbour Road. The Conservancy management structure comprises the CMC, elected in terms of the Conservancy's constitution. In addition to the roles of chairperson, secretary and treasurer set out in the Constitution, the CMC has one representative for each of the four wards into which the conservancy will be divided. The Conservancy's management strategy envisages the appointment of a supervisor to coordinate the maintenance of the public open spaces and road reserves and control of alien invaders. This person could be a full time resident volunteer, or could be an employee of the Municipality or of the Conservancy. He/she shall have the authority to incur costs from within an allocated fund to hire labourers, train them and to purchase equipment within a specified budget. The implementation of the management plan will be monitored annually and report given to the AGM for adaptations and/or ratifications. Management Plan accepted by the Management Committee of the Pearly Beach Conservancy at a meeting held on 31 January 2009. We would like to congratulate you on your purchase of a plot/house in this unspoilt area of the Overstrand, and hope that you will be very happy here. We are proud that the fynbos in this area is part of the most wonderful floral kingdom of the world. Pearly Beach has been registered as a Conservancy with Cape Nature and we trust that you will help us in keeping our area as pristine as possible. A few helpful hints in planning your new garden: When you prepare to build, it is wise not to allow too much of your plot to be cleared of vegetation. Strong winds occur in this region, which cause erosion. The exposed sand blows which results in damage to plants and neighbouring properties. The less damage done to your plants by the builders, the better. It is obviously easier to cultivate the beautiful indigenous plants which occur naturally in this area. They require minimum maintenance and little watering and will thrive here. Buffalo grass is the local natural grass. It requires the least mowing and watering. Please do not plant Kikuyu grass which grows long quickly. It also invades and kills the fynbos and will soon be illegal for this part of the country. Please do not help yourself to young plants in the veld. This is illegal and carries a heavy fine. When buying plants at local nurseries, be sure to ask for plants that are indigenous to this area. Small plants should be protected from wind blown sand which will damage young stems. Protection may be provided by shade cloth, or better, by planting amongst existing plants. Do not dig around indigenous plants. If it is necessary to remove weeds, do so by pulling them out by hand. Digging will damage the small surface feeding roots and will kill the plants. Remember some of the plants you think are weeds may prove to be beautiful self sown indigenous plants. Many exotic plants are attractive, but present a huge danger to our indigenous plants as they are invasive and destroy our lovely vegetation. Rooikrans (Acacia Cyclops) is a Category 2 plant invader, which means that these are plants with the proven potential of becoming invasive, but which nevertheless have certain beneficial properties that warrant their continued presence in certain circumstances. Category 3 plant invaders are undesirable because they have the proven potential of becoming invasive, but most of them are nevertheless popular ornamentals or shade trees that will take a long time to replace. Category 3 plants will not be allowed to occur anywhere unless they were already in existence when these regulations came into effect. The Manatoka (Myoporum tenuifolium subsp. Montanum, also sometimes called M. acuminatum) is a declared Category 3 plant. Proposed Indigenous plants for windy coastal gardens. We trust that you will support our request not to have the few streetlights switched on at this stage. We also prefer that outside lights at houses are not kept burning all night for the following reasons: • Disturbing of the life cycles of small game and insects that feed at night, for example bats, duikers, porcupines, etc. ; • Light pollution; • The observation of stars, as well as the lights of ships at sea, will be severely impeded; • The natural unspoilt environment will be totally disturbed. WHAT CAN YOU DO? - Learn how to identify and control invasive alien plants - join or form hacking teams to remove such plants from your area - remove invasive plants when they are still small - plant indigenous (local) plants in your garden - buy only indigenous plants from nurseries - tell people about the dangers of invasive alien vegetation. Join the Conservancy – membership fees are R30 for an individual and R50 per family! The term ‘herbarium’ means ‘the collection of dried plants or parts of plants that are indexed and stored for scientific research information’. The Pearly Beach Conservancy was started many years ago with a realisation that something must be done to conserve our precious environment, and also to develop a love and interest among the people staying in Pearly Beach. One of the projects begun by the Conservancy at that time was the development of a small herbarium – started with the permission of the local Municipality and Cape Nature Conservation. We were indebted to be able to seek advice from people and organisations in our area with prior knowledge of starting this type of project, e.g. Cape Nature and Grootbos, as well as the friendly ladies at the existing Fernkloof Herbarium in Hermanus. To house the plants, a small wooden ‘house’ was bought and converted into the herbarium building. Heilie Mostert became the project leader and she managed the herbarium from its infancy, through to its new home in a purpose-built brick building on the village green. So how does the herbarium work? “Every Friday, cuttings of fresh plants and seeds are gathered by four ladies for the exhibition room, done strictly under the conditions of the permit issued by Cape Nature.” A GPS reading is taken of where each plant has been picked, and the plant is then identified by making use of research books. Any new specimens that are identified then go through the pressing process. The plant’s scientific name, and the book used to identify it, along with the date it was picked are recorded on the back of the specimen card. This card is then numbered and filed. Each December, a complete list of all the plants that have been picked in Pearly Beach are submitted to Cape Nature. They catalogue the information and, in return, provide us with a satellite photo of where each plant was picked. The reason for the conservation of plant specimens by pressing is so that they can be kept indefinitely and, in Pearly Beach alone, 316 indigenous plants have been identified to-date. The exciting prospect of discovering a plant that was thought to be extinct, along with preserving a snapshot of our unique floral environment is the reason we run this project. So, please come and visit us in our new home on the village green and see for yourself this fantastic and important work. Heilie Mostert is always in and out of the Herbarium clutching various specimens of flowering plants either for display in the fresh flower section or for pressing for scientific documentation. Heilie has now ventured into the garden with the help of Khoisan project workers now known as the W.C. “Working for the coast” project. Her green fingers have been orchestrating the planting of the new fynbos garden in Pearly Beach, which is already starting to bloom, this large section of coastal fynbos designated by the municipality for a village green in front of the new herbarium will be an asset to the area and walking on the winding paths amongst the well labelled diversity of plants growing here will be enjoyed by everybody for many years to come. The top area of the garden paths are being filled with gravel. The first batch of plants arrived to be planted in the Fynbos Garden. The latest addition to the Fynbos Garden are the names of the plants. On the little name board is the scientific name as well as the common folk name. The Fynbos Garden's paths are finally finished. Here and there are little walls between the plants with posters of the local birds. One of the four bird posters in the garden Different types of birds are pictured such as sead eaters, Fynbos Birds and carnivorious birds. 21 December 2013, the Conservancy held its first craft market to generate funds for the Conservancy. The day was a huge success and a total of 23 exhibiters showed their work. This was also an opportunity for the public to walk through the Fynbos Garden and to visit the Herbarium. The first two of five resting benches were completed. For those who want to visit the garden can now peacefully sit and listen to the birds, surrounded by Fynbos. The lovely Brunsvigia orientalis are in full bloom and adds a sparkling bright red to the garden. A special evening that almost went very wrong! Come and see the Pearly Beach stars a guided star gazing evening. Youth nature club and awap shop activities. You will not see Aliens over Pearly Beach..